“NikoArea_” (also known as “NikoRea_”) uses Twitter to spread propaganda on behalf of ISIS. 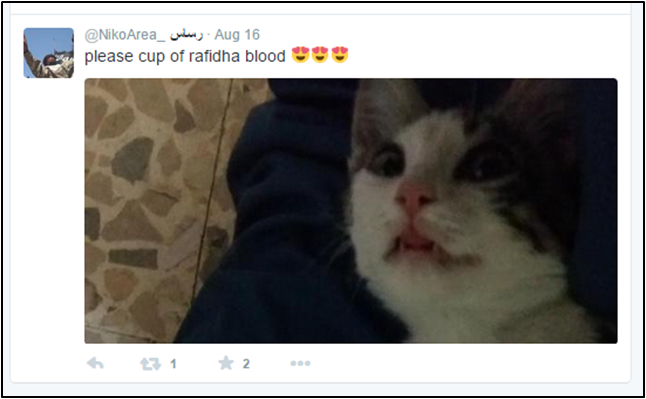 The account holder tweets flippant captions ascribed to his cat—pictured in accompanying photographs—to convey distaste for non-Sunni ethnic groups he considers heretical, such as the Shiite Syrian-based Nuseyri religious group and the “Rafidi,” a pejorative collective term for Shiites.NikoArea_, Twitter post, August 17, 2015, 1:19 p.m., https://twitter.com/NikoArea_/status/633327411040518144. 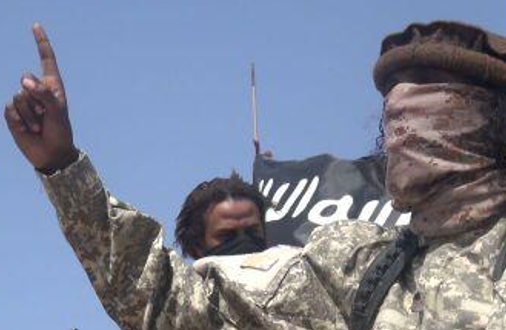 Area also displays contempt for “kuffars,” (nonbelievers) and expresses admiration for those, apparently including his uncle, who have successfully journeyed to the self-proclaimed Islamic State in its defense. He also regularly retweets fellow ISIS supporters’ messages and exhorts others to follow them.NikoArea_, Twitter post, August 31, 2015, 8:12 a.m., https://twitter.com/__ummfaaris/status/638323500114182145. Niko Area was welcomed into the ISIS Twitter propaganda world on August 24, 2015, by Australian recruiter Neil Prakash, a.k.a. Abu Khaled al-Cambodi.itsabUk313, Twitter post, August 24, 2015, 1:15p.m., https://twitter.com/itsabUk313/status/635862888339611648. 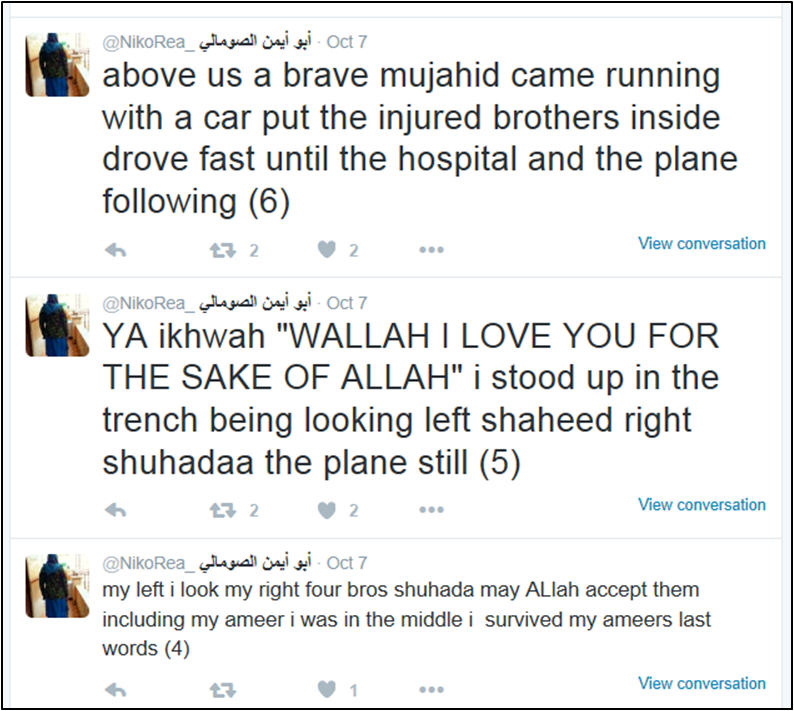 In September 2015, Niko Area appeared to adopt a new Twitter handle, “NikoRea_.” His first posts reminded prospective ISIS recruits that the Islamic “caliphate’s” borders were open, and offered practical tips on what to bring.NikoRea_Twitter post, September 28, 2015, 10:40a.m., https://twitter.com/NikoRea_/status/648552890810925056. Niko Area appears to be an active ISIS militant on the front lines of military operations, according to his tweeted testimony on October 7:NikoRea_, Twitter post, October 7, 2015, 12:58p.m., https://twitter.com/NikoRea_/status/651848612222251008. CEP has been monitoring “NikoArea_” since August 2015. NikoRea_NikoRea_, Twitter, accessed December 3, 2015, https://twitter.com/NikoRea_. “NikoArea_” (also known as “NikoRea_”) uses Twitter to spread propaganda on behalf of ISIS. “[T]he borders to shaam are open alhamdulilah….” (Tweet)NikoRea_, Twitter post, September 28, 2015, 10:40a.m., https://twitter.com/NikoRea_/status/648552890810925056. “Hatred and anger is what is needed fr [sic] the sake of Allah againts [sic] the kuffar….” (Tweet)NikoRea_, Twitter post, November 8, 2015, 1:36a.m., https://twitter.com/NikoRea_/status/663289011172175872.